On Wednesday night, wrestling legend Hulk Hogan has inducted into the Boys & Girls Clubs of America’s Alumni Hall of Fame. Boys & Girls Clubs’ after school programs provide children and teenagers of all backgrounds a safe environment to play sports and learn valuable life skills. The ceremony streamed live on Facebook and can be watched below. Hogan segment begins at the 19-minute mark. 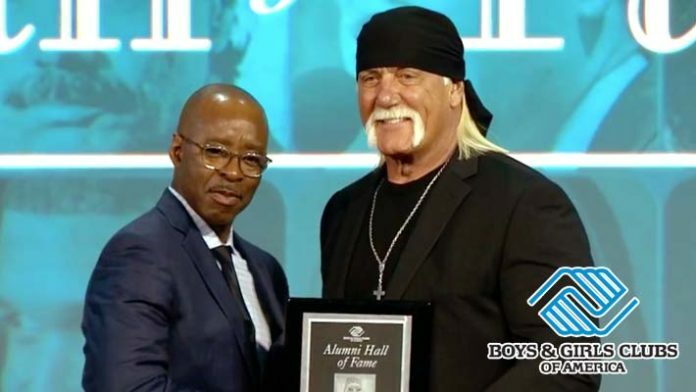 Last night Hulk Hogan was inducted in to Boys & Girls Clubs of America’s Alumni Hall of Fame. For more than 150 years, Boys & Girls Clubs around the country have provided kids and teens of all backgrounds, the opportunity to achieve great futures. To celebrate the accomplishments of former Boys & Girls Club members, the organization annually recognizes distinguished alumni, including these nine inductees who have excelled to the top of their respective fields. Hulk Hogan was one of nine inductees. The ceremony was hosted by Emmy and Tony-award winning actor and Club alum Courtney B. Vance, and honored alumni who have gone on from their Boys & Girls Club to make major contributions in their professions, from sports to entertainment to the military and more. Each of these leaders has followed a unique path, yet they all share a similar beginning – with the life-changing programs, caring staff and the fun, safe environment of a Boys & Girls Club. Honored to help host @BGCA_Clubs national conference with @CourtneyBVance ?? ?